Yes, they were definitely the most delicious fried tapeworms I’ve ever eaten. Sorry, I’ve always thought friend onions look like tapeworms. It’s not even that I dislike them. 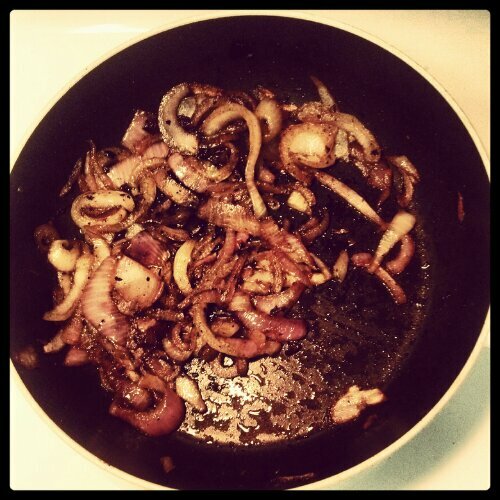 I actually find fried onions to be incredibly tasty. They just also happen to resemble fried tapeworms. Appetizing, I know. You’re welcome. That said, here’s to the most delicious fried tapeworms I’ve ever eaten. Seriously. Maybe one of my favorite uses for bacon grease. Phenomenal. Peel the onions and cut in half so you may slice them thinly, in half-circles. Heat bacon grease in a pan over low heat till liquefied. Throw in onions and cook on medium-low until soft, browned & delicious. I’m going to highlly recommend this website! or do some of the comments appear like they aare comig from brain dead individuals? up with everything new you have to post. Could you make a list of all of all your social networking sites like your Facebook page, twitter feed, or linkedin profile?